There once was an ant named Super Anty, who liked to high step. He took pride in clearing obstacles and in being nimble and quick. Every morning he would rise and set out to traverse the most rigorous series of challenging and undulating surfaces he could find. He’d high step over jagged bricks heaped in a moving wheelbarrow, pebbles sliding down a rain slicked driveway, or the wiggly wagging tail of a puppy who’s strayed into the brush. Super Anty’s adventure yesterday had been a zig zag trek across slow drying concrete – a bit grey and very dangerous for normal ants, but Super Anty was not normal. And although he did not want to admit it, he was a tad tired from his extreme efforts at avoiding the drier spots of the concrete driveway under construction, and the gooey capturey parts as well. Plus, his mother had kept at him for what seemed like hours, reminding him to be careful. So when the sun rose this morning rose bright and sunny, Super Anty heeded his mother’s advice and set out to avoid danger and traverse something “nice”. 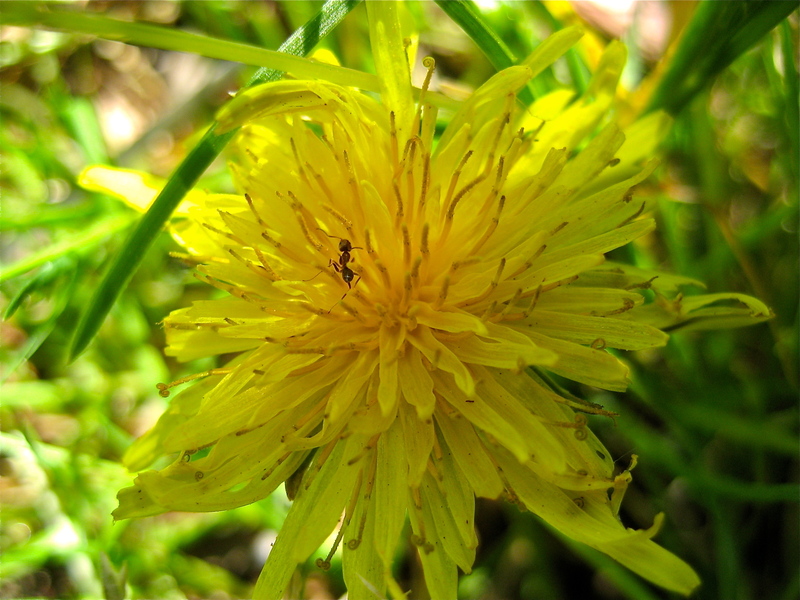 After a quick uneventful stroll around the ant hill, Super Anty spied this dandelion politely waving to him in the breeze, promising him a pleasant jaunt. So Super Anty climbed aboard and found that high stepping over and under the petals to be quite a delight! It required precise aim and concentration and an element of grace to become one with the breeze enhance rhythm of the flower, in order to wind his way across the weed flower’s face in a way that his mother would approve.